Hello Friends, It’s Thanksgiving here in the US and the food is prepared, the house is clean, and I am just waiting for my guests to arrive! My son and new daughter in law are on their honeymoon in Hawaii, (poor guys) so it’s going to be a bit different not having them here. It was bound to happen sometime, so I am just going to roll with it, and be thankful for all that has transpired this past year! It’s also happens to be time for our next challenge at Seize the Birthday! The topping I have for us this time around is Monochromatic. I have a thing for Monochromatic cards and a apparently so does the team. They really did an incredible job! Speaking of team. I wanted to say thanks and goodbye to Patti, one of my DT members. This is her last post with us and to say I am sad would be completely TRUE! Patti and I hit it off right from the start and she promised me that even though she is stepping down as a DT member we are going to meet in person someday! I will hold you to that Patti! You are such a sweetheart and so talented. So don’t be a stranger and don’t stop creating! HUGS to you my friend! I also want to Thank Becca Cruger for being such a wonderful Guest these past few months! It’s been an absolute pleasure having you Becca! Card details: MFT tag and flower dies, Verve -sentiment and leaf dies, and my new love Nuvo Drops! 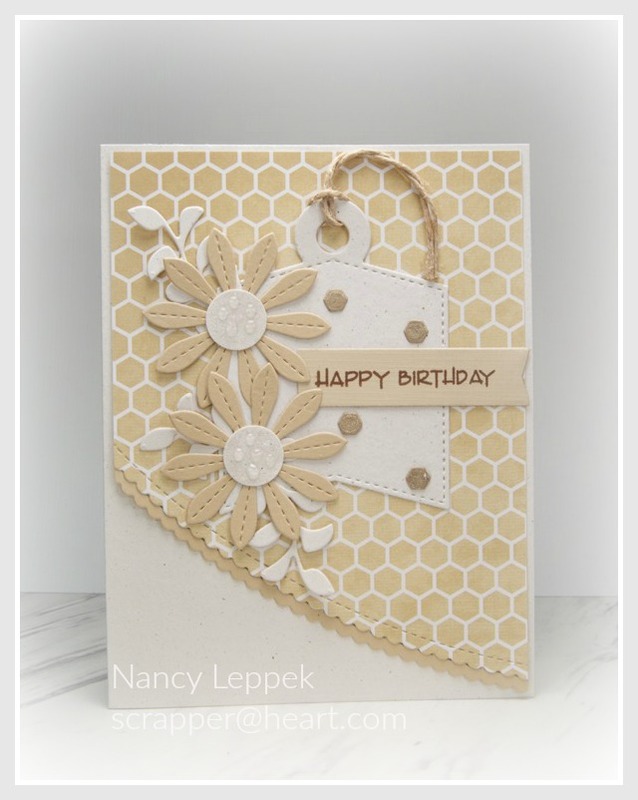 Categories: Cards | Tags: Card making, Cards, color challenge, Happy Birthday, stamping | Permalink. So beautiful and love the layout. Fabulous card, Nancy! I loved the monochromatic color scheme this time around…Happy Thanksgiving to you my friend! Nancy this is gorgeous! Love the neutral color you chose and all the wonderful stitching! This is so lovely in soft neutral color and with so many pretty details !!! I especially love the scalloped and rounded cut of the front panel in layer!!! Gorgeous design! This is so lovely!!! Love the layout, the layers and the fabulous little details.